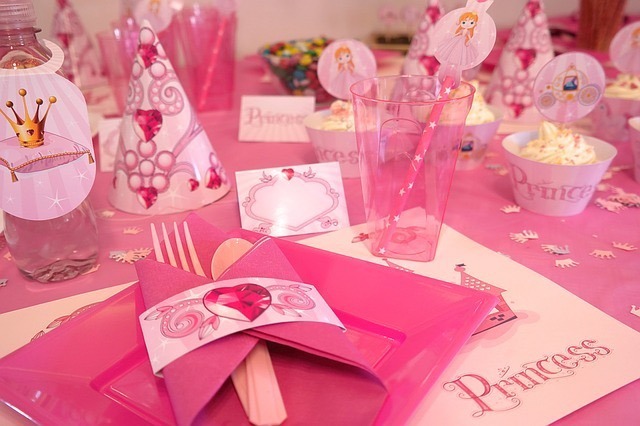 When your daughter is little, a princess-themed party is likely on her wish list. It makes for an adorable display, but it can be quite pricey if you’re not careful. Setting a budget and getting creative is the key to keeping costs low, so here are some budget tips you might enjoy. The easiest way to lose money on a princess party is to buy everything. Your daughter won’t be little forever, and you probably won’t reuse the items often. You can save a lot simply by renting. For a nominal fee, you can get everything from a princess dress to a throne chair rental for your party. Find a party-rental service online and peruse their options to get ideas for decorations and activities. The best part is, you don’t have to find a place to store everything after the party is over. When you’re on a budget, getting the smallest of details right is more important than ever. It ties everything together, even if you haven’t spent a lot of money. For example, you can create the illusion of expensive treats by first making cupcakes with pink frosting. Then, cut crowns out of pink and purple cardstock and glue them to a toothpick and stick one in each cupcake. Similar tiara cut-outs can be glued to the front of your tablecloth as well. For just a few dollars, you’ll have created a cute illusion of royalty. The party handouts are another important detail. Consider something affordable but exciting, like LED light-up toys from online retailers like Premier Glow. You might give each girl a light-up tiara, LED princess jewelry, or an LED wand. It’s little details like this that make your party a success. You can do a lot as far as decorations, deserts, and activities for a little money as long as you’re willing to put in some work. A little creativity and elbow grease can help you create a magical princess party for only the cost of the supplies. Hop on Pinterest to gather more ideas. There are hundreds of tutorials and ideas for those who don’t mind getting their hands dirty in preparation of a party, and you can save hundreds by doing so. Give yourself plenty of time in advance of the party and work on things as you have time. Otherwise, you’ll be racing at the last second to get everything done, and you’ll have a difficult time enjoying your party. Remember that your daughter won’t be looking very closely at the tiaras and princess gear. Plastic tiaras and cheap princess costumes will make them just as happy as the expensive stuff. You can find most of this gear at the dollar store, getting more bang for your buck. You can make sure every little girl gets a tiara. You can hire princesses to make an appearance at your party, to sing songs and take pictures with the girls. It’s always a hit, although it’s expensive. You can get around this by hiring just one or two princesses instead of the whole party. Ask them to come for just half an hour instead of a full hour to reduce the price. The little girls will absolutely love this feature, and it won’t break the bank. Cupcake sprinkles, glitter, and sequins are the perfect princess gear, and they’re affordable to boot. You can allow the little girls to decorate their own cupcakes with the sprinkles or create beautiful crafts with sequins and glitter. Consider doing this part outside to minimize the cleanup. Your daughter will love her princess party not because of how much you spent, but because of the thought you put into it. Get creative and don’t be afraid to get your hands dirty to create a fantastic party on a budget.